Get your $500 Bonus from Party Poker! The site is endorsed by World Poker Tour host Mike Sexton and has strong ties with the tournament series, allowing it to offer satellite qualifiers to many live events that are unavailable anywhere else. Though some way back on its pre-2006 heyday, PartyPoker still boasts a generally high level of online traffic. There's a seven-day average of 1,050 active players recorded at time of writing. This places PartyPoker 5th in the overall rankings for online poker traffic, a long way ahead of Full Tilt Poker, and the site is also able to boast 24-hour peak traffic of 1,521 players during that period. With blind levels of $0.01/$0.02 to $25/$50 available at its No Limit Hold’em cash game tables, PartyPoker’s range of ring game options runs the full gamut from micro limits to serious stakes. Similarly, the site also offers tournament action from as little as $0.22 rebuys or $0.55 freezouts, with those buy-ins increasing all the way up to $530 for regular events and $5,200 for high rollers. This event regularly attracts over 1,000 players, but there are a number of regular events in the site’s weekly Power Series that are suitable for smaller bankrolls – with $200,000 in guarantees set aside for MTTs in the $5.50 to $11 range. 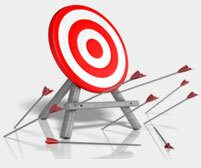 In total, PartyPoker guarantees over $2.5 million each week. Despite possibly shifting away from cash games to offer a better-rounded weekly tournament schedule in recent years, PartyPoker still packs a punch when it comes to ring game action. As mentioned above NLHE can be played up to $25/$50 stakes, while Pot Limit Omaha is capped at $5/$10. 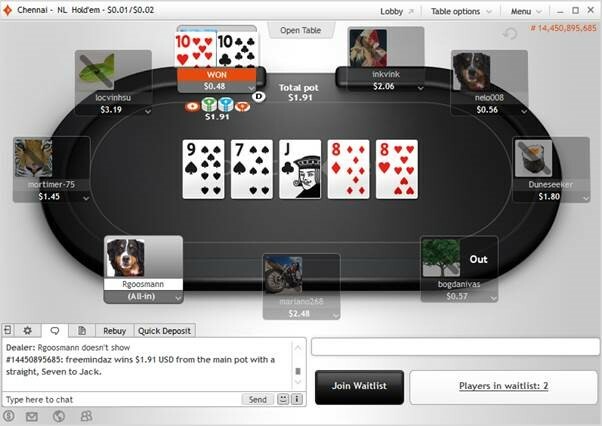 Stud, meanwhile, is a fixed limit game and can be played up to a maximum of $30/$60. At PartyPoker, Australian players have a total of 10 different no-fee methods to deposit and withdraw funds, with all major credit cards and eWallets featuring alongside direct bank transfers. While credit and debit cards obviously offer unrivalled convenience, cashouts using these methods can take up to five working days. 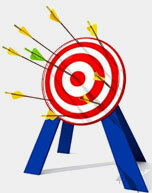 EWallets, meanwhile, are usually credited within 24 hours. 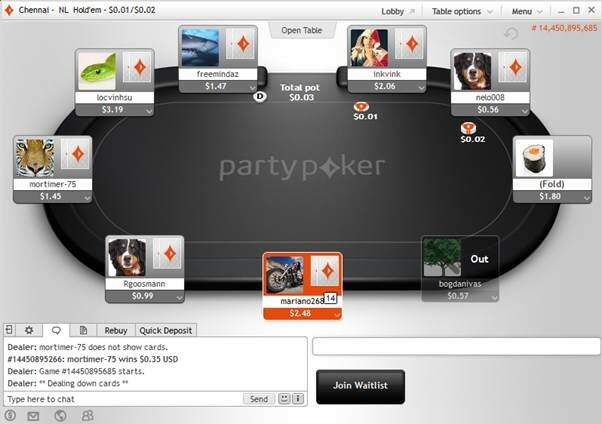 A couple of years ago, PartyPoker experienced a complete design overhaul as the site traded its slightly “wacky” appearance for clean lobbies and a simple black, white and orange colour scheme. New players at PartyPoker will benefit from $20 absolutely free whenever they deposit $10 or more, but in truth the site’s bonuses are more based on achievements and loyalty that instant gratification. Not only does PartyPoker boast a hugely rewarding VIP scheme, but players will unlock tournament tickets and further bonuses as they complete various “missions” on the site. This provides a tangible sense of reward for sustained play and a series of milestones on which to judge your achievements. Are you kidding? PartyPoker is one of the most respected online operators in the industry and has a track record for fairness that is beyond scrutiny. Players at PartyPoker will find Texas Hold’em, Omaha, Omaha Hi/Lo, 7-Card Stud and 7-Card Stud Hi/Lo all readily available, with all games on offer in Limit, No Limit and Pot Limit where applicable. Yes. 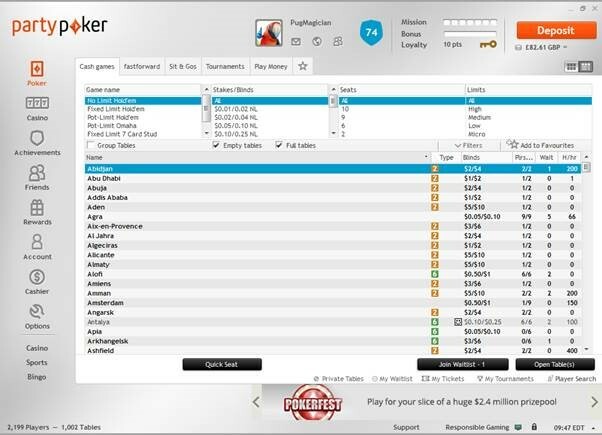 You must download PartyPoker’s software to your PC, mobile or tablet before you can start playing at any of the site’s tables. They certainly do. PartyPoker is available as a downloadable app for iOS and Android operating systems, making it easy to enjoy its great games on the go. No. While you can choose your account currency from a wide range of options, when you actually start playing your game currency will always be in USD, CAD, GBP, EUR or Japanese Yen. Yes. 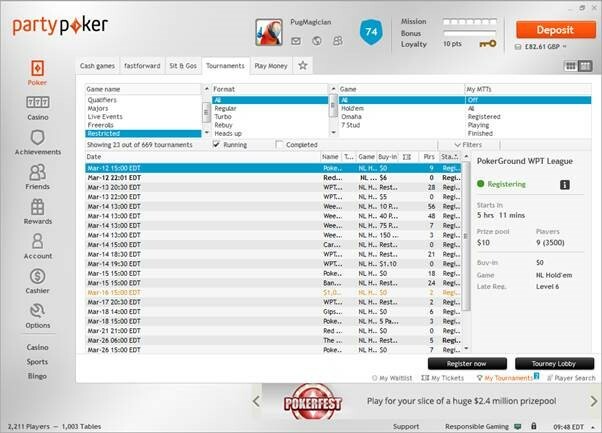 There are a number of play money tables and freerolls at PartyPoker and players can also use their free $20 bonus to try out the full range of games. Of course. PartyPoker have been steadily improving their tournament offering in recent months and the site’s current Power Series now boasts over 450 tournaments and $2.5 million in guarantees.